Diesel engines have major inefficiencies. The most wasteful and environmentally harmful is the unburned fuel that enters the exhaust system without being burned or benefiting the engine. Unburned Hydrocarbons plus other greenhouse gases equal fuel money spent to pollute our environment. 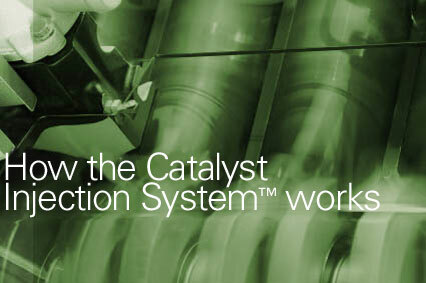 EcoEmissions’ Catalyst Injection System™ (CIS™) creates a vapor containing very small particles of certain catalytic metals — primarily platinum. This vapor is carried through the air stream utilizing the draw of air through the intake manifold. As the air arrives during the intake stroke, these catalytic particles are inert. As the air compresses when the piston rises, heat is created and the platinum becomes active at approximately 621 degrees Fahrenheit. This is long before the fuel arrives. The platinum immediately begins to affect the residue carbon that exists on top of the piston, on the cylinder walls, on the heads, and on the tip of the injector. It creates rapid oxidation as the platinum and hydrogen react to each other in the presence of oxygen at that temperature. The soot particles become unstable, begin to breakdown, and are almost completely removed as they burn and exit the cylinder. This process happens before the fuel arrives. 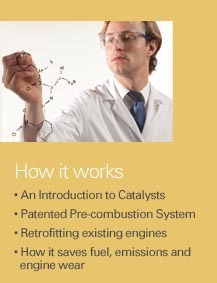 The fuel arrives when the cylinder is at a temperature in excess of 700 degrees Fahrenheit. It doesn’t begin to burn until the cylinder has reached over 1000 degrees. The platinum causes the fuel to burn at lower temperatures, creating a longer burning period during the power stroke cycle. The time from injection to ignition is significantly reduced. The fuel is more completely burned and it actually creates more work output. The result is more work done with the same fuel or less fuel required to do the same job. Exhaust emissions are greatly reduced. Engine harmonics improve. Exhaust temperatures decrease. Engine core temperatures decrease. Engine oil life is extended. Engine life between major maintenance intervals is extended. Black smoke, NOx, CO and Co2 are reduced.